Thank goodness for the intransigence and political buffoonery of our Illinois public officials. Without their ceaseless bickering, the ill-fated and monumentally stupid Great Imaginary Airport project envisioned near Peotone might actually get off the ground. As it is, the GIA — known variously as the South Suburban Airport (its IDOT-sanctioned title) and the Abraham Lincoln National Airport (Jesse Jackson, Jr.’s grandiose appellation) — exists only in the misguided minds of transportation technocrats and Pollyannaish politicians. This bizarre state of affairs stems, in part, from our elected leaders having serious control issues. Ever since I began writing about the GIA fiasco in 2007, debate has raged about who gets to sit on the airport’s board, what to call the facility (see above), and which paint colors should adorn the terminal’s bathroom walls. 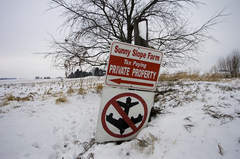 What gets overlooked in this petty drama are two things far more important and disturbing: (1) the grand fiscal folly of a bankrupt state spending untold millions to construct an airport 40 miles from Chicago’s Loop that no commercial airline wants; and (2) the grotesque social injustice of government land grabs perpetrated against law-abiding, tax-paying rural landowners within the phantom airport’s ghostly footprint. The GIA is so far from physical realization that even its most ardent supporters have no idea when it might actually be built. Due to the project’s incompetent political sponsorship thus far, final FAA approval is probably still years away and far from guaranteed. At least I hope so. Despite those damning facts — and the stark economic reality that Illinois is billions of dollars in the red and cannot even pay its regular bills as required by law — Governor Quinn continues to pledge $100 million of state money for additional land acquisition for the GIA. That’s not counting the money we’ve already blown. To date, IDOT has spent $34,014,383 and change (of taxpayer funds) acquiring 2,471 acres of prime Will County farmland surrounded by the small towns of Peotone, Beecher, and Monee. But since thousands of acres remain in private hands within the GIA’s footprint, and with land prices at historic lows, IDOT officials have stepped up the pressure on unwilling sellers by commencing formal condemnation proceedings. 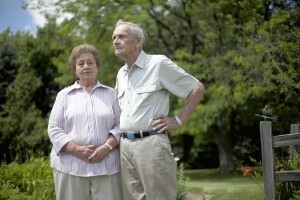 This means that folks like Vivian and Willis Bramstaedt, who had hoped to retire on their farm near Beecher as they enter their sunset years, are being taken to court and will have their land condemned. What the State wants, the State gets. I ask you this: why is Illinois spending millions of dollars it doesn’t have to take citizens like the Bramstaedts to court and condemn their property? How can such a thing be tolerated by my fellow citizens in the Land of Lincoln? And why don’t any of our elected representatives have the backbone to stand up and state the truth about the monumental waste and injustice of Peotone’s Great Imaginary Airport? A version of this essay appears as my monthly op-ed column (“Great Imaginary Airport a Boondoggle for Illinois“) in the 23 Feb 2012 edition of the Joliet Herald-News. For information about the airport’s plan, land acquisition data, maps, documents for FAA reviews, etc., see the official IDOT website. And for additional commentary, check out my previous columns from the Herald-News about the Peotone Airport archived on this site. This entry was posted in Agriculture, Economics, Land use, Peotone, Politics, Social justice, Transportation. Bookmark the permalink. prints an article on Quinn’s plan to close the Dwight Correctional Facility,–the only “all women” prison in the state. Devastating to Dwight. Also, his announcement to close many other facilities in the state and consolodating many others, such as the state police, mental institutions, other state prisons and the list goes on and on. What is this man thinking of? Maybe a way to get more money to be spent on the GIA !